i've been at this for awhile now, going on ten years actually, and in ten years, i've had to figure a lot of stuff out. DO THINGS NOT QUITE FIT TOGETHER? soundsbadman. BUT HAVE NO FEAR! With minimal scripting knowledge/support, i've managed to cobble together several games from scratch. 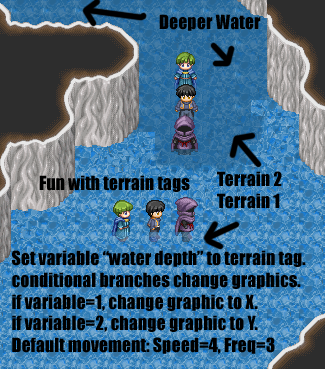 I've learned the ins and outs of rpg maker xp, and can do almost anything. I've ghetto rigged character select screens, quicktime fights, race riots, concerts and ice cream trucks. i've written museum heists, snowman attacks, "lost woods" type scenarios, drug induced kidnappings, and lesbian lancers. all prices on a per project basis.